According to the â€œFinancial Investment Newsâ€ report, 2012 will be the traditional Chinese dragon year. Although there is still some time away from the New Year, various precious metal products of Lunar New Year have already started to fight for sales. In an interview, the reporter found that, as in previous years, various kinds of gold bars accounted for half of the precious metal products of the Lunar New Year Lunar New Year. Although this year's Lunar New Year gold bars have set the highest issue price over the years due to the soaring gold price, New Year's gold bars are still highly sought after by investors. However, experts in the industry have stated that the New Year's gold bars of different brands and different channels of purchase have very different prices, fees, collection values, and liquidity, and consumers must be careful when choosing. As the products are getting richer and near the end of the year, the Lunar New Year bullion market is once again active. In recent days, with the large number of Lunar New Year Lunar New Year gold bars listed on the market, gold bullion market has set off a "tornado." The reporter found that, compared with the previous year, sales channels for New Year's gold bars this year were mainly concentrated in the major banks, China Gold Coin Head Office and jewelry companies. However, it is worth mentioning that the New Year's gold bars launched this year show many bright spots both in terms of design and in terms of manufacturing processes and specifications. Taking the 2012 (Yichen) Lunar New Year Lunar New Year Gold Bar issued by the China Gold Coin Corporation as an example, the former large-scale varieties accounted for the protagonist's situation, including 1,000 grams, 500 grams, 200 grams, 100 grams, 50 grams and 5 specifications. In the design of Lunar New Year's gold bars, there is naturally no shortage of elements of â€œDragonâ€: the front side of the gold bar is a â€œDouble Dragons Beadâ€ of the â€œDragon Dragonâ€ shape in the Shang and Zhou dynasty, which implies auspiciousness and celebration; Chapter; four calligraphy characters in the middle of the "Longyear Lunar New Year." In addition, the Lunar Year of the Year Lunar New Year gold bars launched by some banks are also very rich in their products. Some banks have introduced more than a dozen New Year gold bars. The highest increase of nearly six times According to the relevant person in charge of the China Gold Coin Corporation, when the first year of the Lunar New Year in 2003 was issued, its initial price was 94 yuan per gram. After that, as the international price of gold rose all the way, the annual New Year gold bars were also rising. In 2004, the initial price of gold bars for the year of the monkey rose to 104.5 yuan per gram. 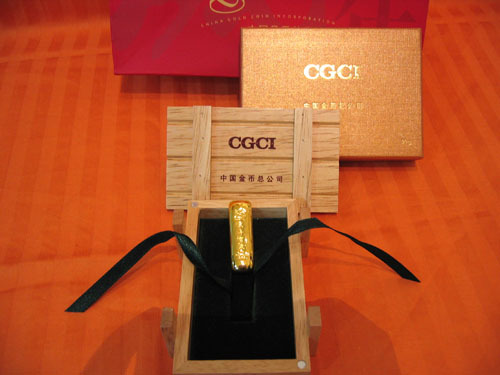 By 2008, the initial price of rat gold bars will exceed 200 yuan to 222 yuan/g. By 2011, when the Rabbit Lunar New Year gold bar was issued, the starting price rose to 322 yuan per gram. By the time of the 2012 issue of the Golden Year of the Dragon, its initial price rose to 398 yuan per gram, which was 76 yuan more than the 2011 year of the Rabbit Lunar New Year. "Fortunately, this year's Lunar Year of the Year Lunar New Year gold bar pricing in the fourth quarter, the international price of gold has been back from the highest in September more than 1,900 US dollars per ounce to 1,700 US dollars, or the price is not only 398 yuan / gram." China Gold Coin Corporation-related The person in charge told the reporter. According to report, since the China Gold Coin Corporation issued the Lunar New Year gold bars at the end of 2002, except for the first price of the 2009 Bull Bullish Year 2009 issued by the end of 2008 due to the financial crisis, the price of the bullion was first reduced by 216 yuan. /g, the initial price of rat gold bars in 2008 was RMB 222/g), and the starting price of New Year gold bars issued in the remaining years was approximately 20% higher than the previous year. In the collection market, the reporter found that the new year's gold bars issued in earlier years showed a total increase of four or five times. The earliest issue of the 50-year-old Chinese New Year of the Goat was the initial price of 94 yuan per gram for the first year of the year. The current market price is around 610 yuan per gram, which is nearly six times that in nine years. The annual gold price of monkeys also rose from the issue price of 104.5 yuan/g to nearly 600 yuan now, and the increase was also close to five times. The sales price of the current year's Dragon New Year gold bar is currently raised to 435 yuan per gram, which is nearly 10% higher than the initial price. According to the preliminary statistics of the reporter, all kinds of New Year gold bars on the market are no less than 20 varieties, and the specifications are as many as a hundred kinds. Because of these New Year's gold bars, some are issued by ordinary companies, and some are issued by state authorities. This has also caused the current whole New Year's bullion bargaining market is mixed. If it is for the purpose of investing in collections, when faced with such a rich New Year gold bar, the selection of varieties will be sufficient. It is particularly important. Experts suggest that when collecting investors to choose the Lunar New Year gold bars, collectors should first figure out the issuer. Gold bars are divided into "official" and "civilized". â€œGovernmentâ€ is issued by an authoritative organization and is issued in a limited manner. This guarantees the investment value of the collection of gold bars. Generally speaking, the New Year Gold Bar issued by the China Gold Coin Head Office is a well-recognized â€œguan guanâ€. The "civil articles" are basically gold bars issued by ordinary enterprises. From the point of view of authority, "civil articles" are naturally inferior to "guan officials", which also determines that the value of "collective articles" for collecting investments is less than that of "official posts." In addition, it is worth noting that, in general, beautifully designed New Year's gold bars because of the higher cost, the "premium" generated outside the gold price is also higher, so many of the New Year gold bar's "premium" reached 20 yuan / g ~ 30 Yuan/gram. However, due to the current poor repurchase channels in the domestic gold market and the higher handling fees, many gold bars have higher market prices, but if deducting high transaction fees at the time of repurchase, most of the gold bars have little profit margins. . Therefore, for collectors who invest in New Year gold bars, they should be held for a long time without having to consider too much about the short-term ups and downs of the price of gold.